In many respects it is, except when you have to put up those Christmas decorations. Then sometimes, it just ain’t that wonderful. In our household, I do the outside stuff. Nothing says fun like decorating the outside of your house with festive lights and freezing fingers standing atop a rickety ladder tottering over the bushes in front of the house. My wife does the inside decorations. Sometimes she doesn’t have much fun either. When my daughter was younger, we did the outdoor stuff together, Actually, it was a ruse to get out of the house when my wife was getting frustrated trying to put together the Christmas tree and string the lights. I think you get my drift. (Ba doom tsss, a December snow joke). So far, the tree has not flown through the picture window, but some years that seems a veritable possibility. One time, we actually had to get as far away as a store under the pretense of needing more lights because the front yard was not far enough away. Although, it really wasn’t much of a pretense. In our quest for lights that year, we ended up buying the corniest decoration of all time. We chose it, partly due to budgetary constraints (it cost just $12.99) and partly because it was just so darned silly, we had too. We giggled all the way home about the corny little reindeer we purchased and we still giggle every year when we pull him out. His name is Bucky. It could be a she for all we know. 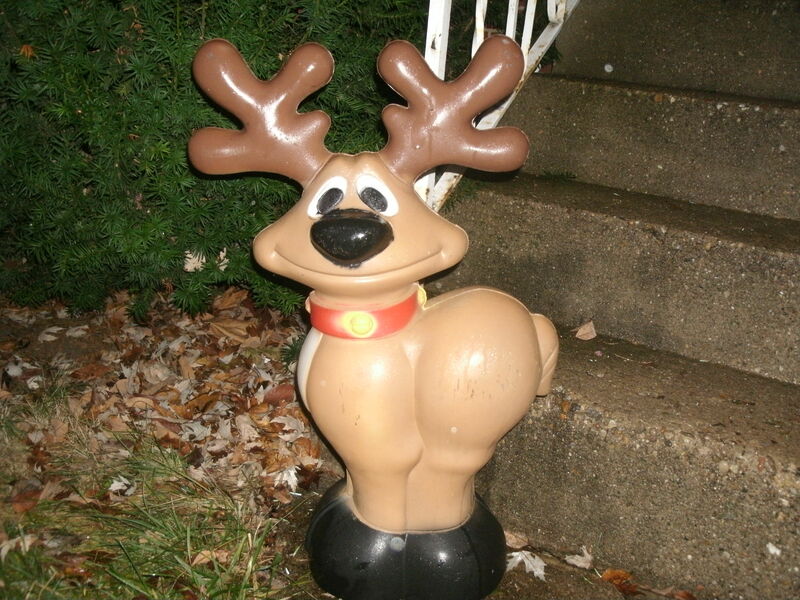 There are no little reindeer parts to determine gender, but the picture is atop this entry so you decide. In any event, Bucky is the last out of the garage and makes a ceremonial procession to the front lawn each year. It signals another year’s successful hanging of the outdoor decorations. Don’t get me wrong. On a scale of one to Clark Griswold, our house is a five at best. But these little lights of mine, I’m gonna let them shine. So, I leave you with this question. What is your favorite corny decoration that makes you smile at Christmas? An alert reader from North Carolina pointed out to me that yesterday’s date was 1203-2013. We could not figure out the cosmic significance of the date, but we did learn it was not the winning Pick 4 number in the state lottery.